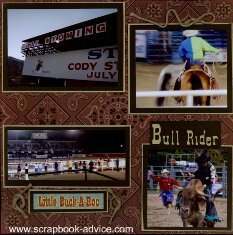 The Cody Wyoming Scrapbook documents our trip to Cody which started out with a couple nights at the Cody Night Rodeo and some great scrapbooking ideas for Western Scrapbooking using some kits with papers and embellishments purchased from two great scrapbook stores. The first was just down the road at the Cody Craft & Scrapbook Company at 742 Yellowstone Avenue, Cody, WY 82414 and the second was from the Life's Journey Scrapbooking at 109 E. 8th Ave, Cheyenne WY 82001. Scrapbook Advice Tip: I forgot to take photos of the finished kits, so I just mixed the items from all the kits and used them as I needed them. So, if you purchase a kit and really like the layouts design, check to make sure there is a photo on the package or ask permission to take your own photos. 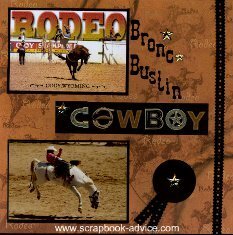 For the first two Cody Wyoming Scrapbook Layouts, I used background paper called Rodeo from Steve’s Pages licensed by Sugar Tree purchased at the Cheyenne, Wyoming Store. 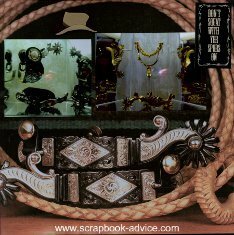 The "Cowboy up" Die Cut purchased from the Cody Craft & Scrapbook Company store as part of a kit as was the Black Felted Ribbon. The cowboy title sticker and Gold Stars came in kit and were from Jolee's Boutique, Title Waves. 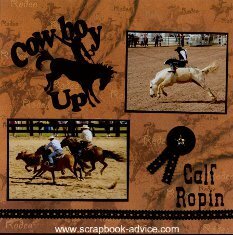 Journaling letters spelling out "Bronc Bustin" and "Calf Roping" done with Cricut Imagine and Wild West Font. Background papers are a Red Bandana from K & Company called Bandana Flat and a Sage Green with a 12 x 12 overlay from Marah Johnson of Creative Imaginations. Dark brown card stock mattes from Bazzill Basics paper pack Basics was from my stash and were used through out. On the left photos were double matted with a thin sage green to match the left page and bring out the light green in the Bandana print. 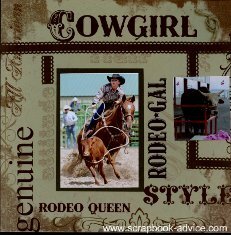 The "Rodeo Gal" sticker was also from the Marah Johnson collection. The Scalloped ribbon is felted brown with black on other side came with one of the kits and the "Buck-a-Roo" sticker under the photo of the children's portion of the rodeo was from Sandy Lion sticker designs called Western Words. The knots tied with brown cording from the kits. Journaling letters spelling out "Bull Rider" done with Cricut Imagine and Wild West Font. 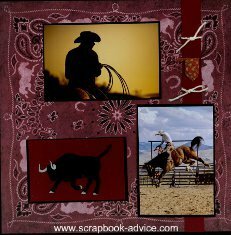 These last Cody Wyoming Scrapbook Layouts from the Rodeo use background papers are Red Cardstock and a different Red Bandana background by Karen Foster. All photos were matted with Black Cardstock. The Black Velvet Bull sticker was from Jolee's Boutique and the "Yee Haw" sticker was by Rusty Pickle from the “Git er dun” sticker collection. Journaling letters spelling out "Clown Car" done with Cricut Imagine and Wild West Font. Unfortunately it does not show up well in these photos as it is written in Black on the Red background. 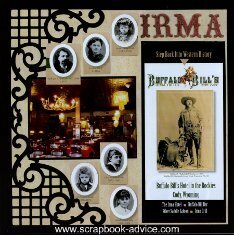 For these Cody Wyoming Scrapbook Layouts that focus on the founder of Cody, "Buffalo Bill" Cody and the beginning of the town, The Irma Hotel in the Rockies. Background used was a Black Scroll Die Cut from Dillon's Laser Designs with a light tan background page called Sonnets from Creative Imaginations. 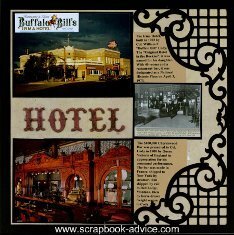 I used the Brochure about the Hotel/Restaurant/Bar due to the interesting photo on the front of "Buffalo Bill" Cody. The left layout shows a photo of the inside of the restaurant, the right uses purchased post cards and a photo from the Historical Center in Cody showing the Irma Hotel outside and inside. The lettering was done using adhesive chipboard lettering that came with an Anna Griffin® Fresh and Floral Instant Scrapbook Kit. I liked the font for this western town layout, but they were Pink so I inked them up with a little Distress Ink in Vintage Photo from Tim Holtz. The hotel built in 1902 was named for his Bill Cody's Daughter Irma. Photos of each of the family members are placed on this page also. The journaling on the right side discusses the history of the Hotel and the story behind the $100,000 Cherrywood Bar presented to Col. Cody in 1900 by Queen Victoria of England for his Command Performance of his Wild West Show. 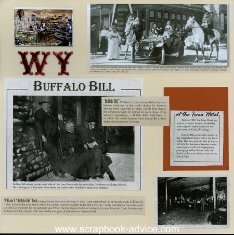 These next two Cody Wyoming Scrapbook Layouts show some of the History of the Town. The photos and journaling all came from a guide book I picked up while in town. 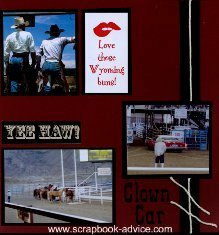 The background is a plain off-white card-stock with 2 small pieces of rust card stock from my stash and one Title sticker "Wild West". The lettering was the same used in the layout above about the Irma Hotel. 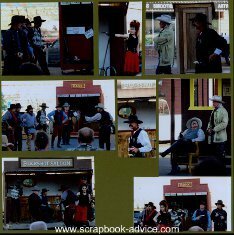 These two Cody Wyoming Scrapbook Layouts show some of the interesting things I saw while in town. The background papers were found a the local Cody Craft & Scrapbook Company Store, the one on the left obviously specially made for the store, the one on the right was Rusty Flowers - Distressed from Stamping Station. Both were in one of 6 layout kits I was lucky enough to purchase from the store. Each kit was priced from $9.00 to $11.00 and I was impressed with the nice selection of papers and embellishments in each. The Embellishment of the Stage Coach "Rollin' into Cody Wyoming" was purchased from the store for $2.99. It's pretty elaborate for the price with two pieces of brown and tan handmade paper, a cut out of stage coach and horses, a large brad and leather rope hanger. 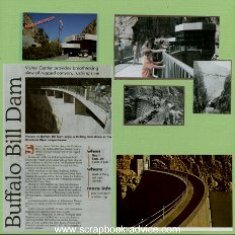 These next Cody Wyoming Scrapbook Layouts use a new product that I recently found at Scrapbook.com called a Swinging Shutter (or Gatefold) Page Protector. I recently ordered a set of 3 of these and loved the idea of using this for the Shoot-Out at the Irma Hotel. I had taken a lot of photos during the Gunfight and the pictures told everything that happened so there is no journaling and all the photos are cut to different sizes. Click on the banner ad to purchase these. Once you get to scrapbook.com, go into the search box for page protectors or swinging shutter. 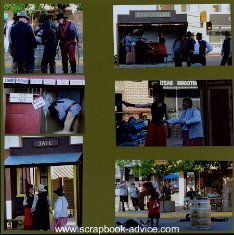 Another reason I used the Swinging Shutter or Gatefold page protectors was that the Jail in the Gunfight props had Swinging Shutter Doors reminiscent of the Old Saloon Doors - and no wonder the captured "bad guy" was able to get himself out of jail. Just another way to remember what happened without the journaling. 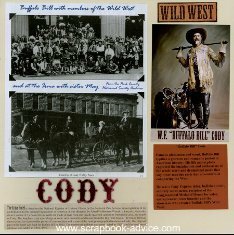 Again using the Scrapbook.com Swinging Shutter (or Gatefold) Page Protector for the rest of the photos Cody Wyoming Scrapbook Gunfight - these are the inside pages done the same way. Scrapbook-advice.com Tip: The card stock or paper for the right and left sides of the Swinging Shutter are a 12 x 12 cut in half to make 2 sides 12 x 6 inches. Actually the 6 inch size needs to be trimmed just a shade to fit into the right and left sides. Another scrapbook-advice.com Tip: While this is perfect for making 4 layouts of the same theme if you have a lot of photos, it is also a great way to use some of that double sided paper if you happen to like both sides and if they are coordinated. 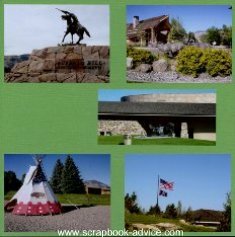 These two Cody Wyoming Scrapbook Layouts show photos from my lunch at the Chuck Wagon outside the Buffalo Bill Historical Center and a the "Cody Trolley Tour" that I took as I was introduced to the features and histories of the town. The background papers were just a light tan and dark brown Bazzill Card Stock. The items on the left page were matted with some rust card stock left from my stash. 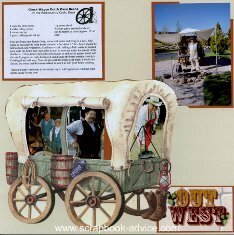 On the left page, the Chuck Wagon Die cut was purchased many years ago and has cut-outs to insert three small photos behind it. The "Out West" journaling tag was from the packaging. My photo shows the cook in the morning as he was cooking the coffee and the Chuck Wagon Dutch Oven Beans by Dave, the Backcountry Cook. In the afternoon when I returned, the coffee and beans were done. I had them for lunch and the beans were so good, Dave was kind enough to give me a copy of the recipe. My version of the recipe will never be that good, simply because I could never duplicate the atmosphere. Maybe if I move to Cody. 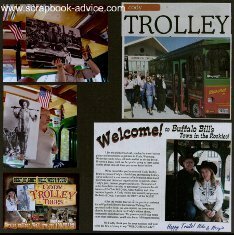 On the right page of these Cody Wyoming Scrapbook Layouts, the photos on the left came from a Cody Wyoming Guide Book and show the "Cody Trolley Tour as it picks up passengers from the Historical Center and a journaling block with photo of the tour guides owners. The Trolley Tour was fun, interesting, filled with a lot of historical facts, large photo posters and even a few artifacts. Well worth the price. 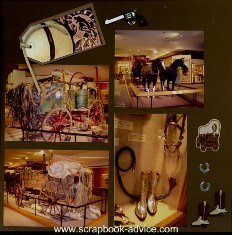 These two Cody Wyoming Scrapbook layouts show just a few of the items on display in the Cody Historical Center which is a collection of 5 different museums. If you are planning to visit, please allow at least 2 days to enjoy the museum. The background papers were just dark brown card stock from Bazzill. Embellishments were stickers of a stage coach, boots, horse shoes and a pistol to go along with the photos in addition to a tag showing hat and spurs and a journaling sticker "A Pair of Six Shooters Beats a Pair of Sixes"
These two Cody Wyoming Scrapbook layouts show some more photos from the Historical Center - focusing on the Spurs, Saddles, Ropes and Hand Tooled Leather Cuffs worn by Cody himself. 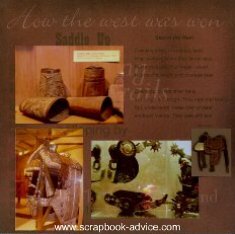 The background papers were found at the local Cody Craft & Scrapbook Company Store, the one on the left says "How the West Was Won" from Tumblebeasts Wild West Collection. The background on the right has the print of the rope and silver spurs from the J Q Outdoors Collection by Sugartree. The embellishments of the Saddle and White Hat were from Jolee's. 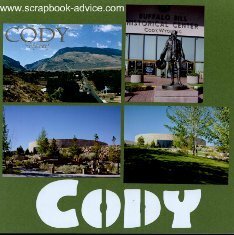 These two Cody Wyoming Scrapbook Layouts show some of the very many beautiful statues that were in place all over town. The background papers were found a the local Cody Craft & Scrapbook Company Store, the one on the left obviously specially made by or for the store, a dark green paper with Cody cut out. I placed a white background strip on the back. The background on the right side was picked up years ago at a Scrapbook Expo in Atlanta, GA. 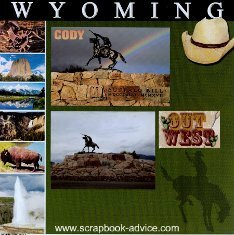 It shows several prominent photos from the state of Wyoming. The strip on the bottom merely says Wyoming - there is no manufacturer. The post card of The Scout, the Memorial Bronze Statue to William F "Buffalo Bill" Cody by Gertrude Vanderbilt Whitney was Dedicated in 1924 and it is prominently featured at one end of the town. The entire area is stunningly beautiful and the Bronze is an amazing piece of work. 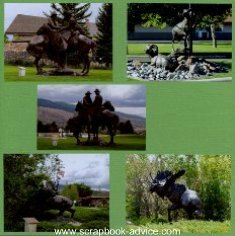 Two more Cody Wyoming Scrapbook Layouts showing some of the beautiful bronze statues that were in place all over town. The background papers were simply a green Bling Bazzill. I found some information on some of bronzes and once I have collected more information I will put it all into a journaling block in the center of each page. There are no embellishments as I couldn't think of any to use. 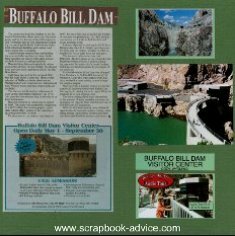 These two Cody Wyoming Scrapbook layouts show some of the photos and information from a tour of the Dam. The background papers were simply a light green and dark green Bling Bazzill. All the photos and journaling were provided by a brochure picked up on the tour and Cody guidebook information. There are no embellishments on these pages. 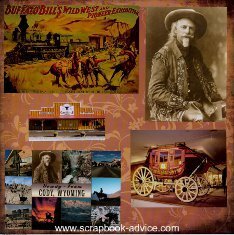 I hope you have enjoyed these Western Scrapbooking layouts and have been able to find out some of the neat products that are available for western scrapbook layouts used in the Cody Wyoming Scrapbook. I had fun collecting the items, seeing the town, and putting together these pages. 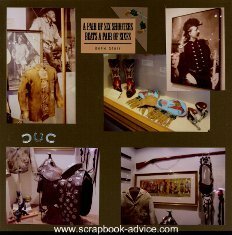 or the Custer Statepark Scrapbook. for Road Trip Tips, Ideas and Things to do along the Way. 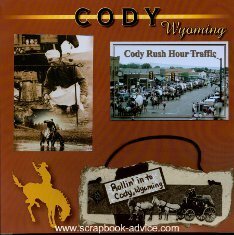 from the Cody Wyoming Scrapbook.